Privately owned public space becomes visible when it is threatened. 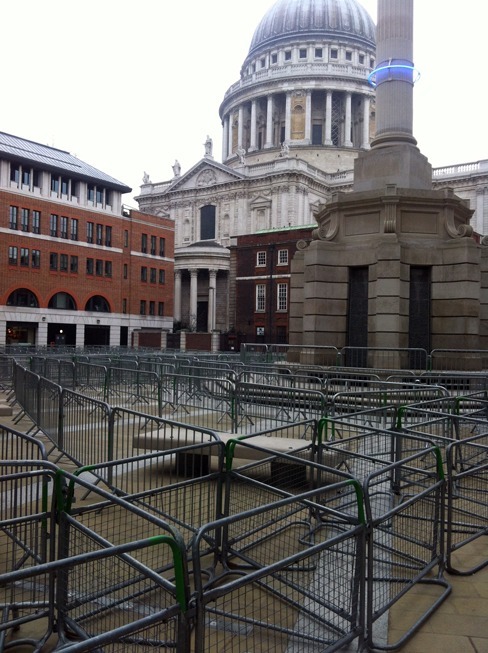 These barricades appeared in Paternoster Square in London after Occupy London tried to reclaim the privately owned square. The protestors ended up camping adjacent to the square outside St Pauls cathedral. Customers who wanted to access its bars and restaurants had to sign-in with private security guards who controlled access points. The hundreds of inter-locking barriers that filled the square were there to prevent any type of occupation from occuring. The square is owned by the Mitsubishi Estate Co.